The Hoover DXC4C47W1 washing machine 1400RPM 7kg is ideal for a small to medium household, with a wash load capacity of 7kg. A slim depth of just 40cm makes for an easy installation into tight spaces. The Hoover washing machine DXC4C47W1 is the perfect choice for kitchens with shallower units or with plumbing behind. The quick wash programme featured on the Hoover DXC4C47W1 washer allows fast cleaning of smaller loads; ideal for when you're in a hurry. Special programmes such as woollens, hand wash, and silks will allow perfect results for most fabric types and loads. A large rotary dial is used to select wash programmes, spin speed and special progammmes. 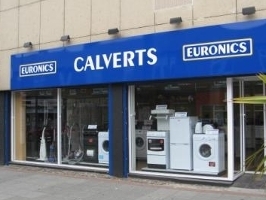 This Hoover washer is an exclusive Euronics agency model.